Today I worked on my submission for an art challenge to one of my favorite mixed media art magazines. If you haven't discovered this yet, check it out here: Cloth Paper Scissors Magazine. The whole website is a great resource for mixed media artists. I love getting the magazine in the mail every couple months. You can also find it at craft stores like Joanne's or Michael's. It's filled with ideas and inspiration and it's what got me motivated to get back into art making a few years ago. In every issue, Cloth Paper Scissors hosts an art challenge for readers to submit a piece of mixed media art for publication in the magazine. Their November/December challenge was to Make Mine Mini. 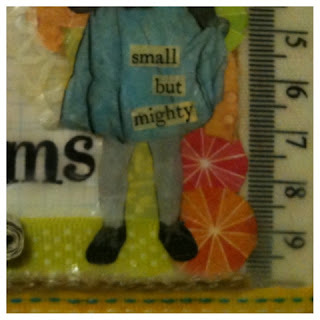 So today I worked on my 4"x4" mixed media piece. Small proportions call for big creativity. How to fit juicy art on such a small canvas? This will be my first art submission to a magazine. Getting published is on my Creative Bucket List this year, so keep your fingers crossed for me! I'll find out on January 11th if my piece was chosen to be a finalist for publication. I've decided that no matter what happens, I get a big pat on the back for putting myself out there. Congrats love! I'm so proud of you for putting yourself out there. What you don't realize is this isn't the first time you've "been published" I have introduced a few people to your blog and not only has it become a source of inspiration for many of us it has also become a topic of conversation right along with the McCall's and Simplicity release of the Spring 2013 "Book". (To goobers like me who have as many patterns in their files as clothes in their closet this is a very exciting sneak peak at what new styles are being released in pattern form for the coming season)and on one occasion your blog was even mentioned in conjunction with your favorite magazine. Don't short change yourself what you do here is HUGE and probably makes a much larger impression than you realize! Oh friend, thank you thank you for your kind words! Just what I needed to hear after visiting the Cloth Paper Scissors community forum where talented artists have posted their amazing pieces for submission. I was feeling a little inadequate until I read your words. You've reminded me that my purpose isn't just to get my art out there, but to inspire others to awaken to their own creativity. Glad I'm fulfilling that purpose on your end. :) That means the world to me!